Can you guess this bird we saw in Churchill? Last weeks was a Brown-Headed Cowbird! Finally, another post. I removed the Churchill Bird Trax because it has been 30 days since our trip, and there are no recent checklists, so it doesn't show them any more. And if you don't know what Churchill is, I'll give some information about it. Churchill is a Town in Northern Manitoba, with a population of about 800, that can only be reached by train or plane. In the summer it is a birdwatchers paradise, and has Polar Bears and Beluga Whales. The map below shows the basic layout of the area around Churchill. 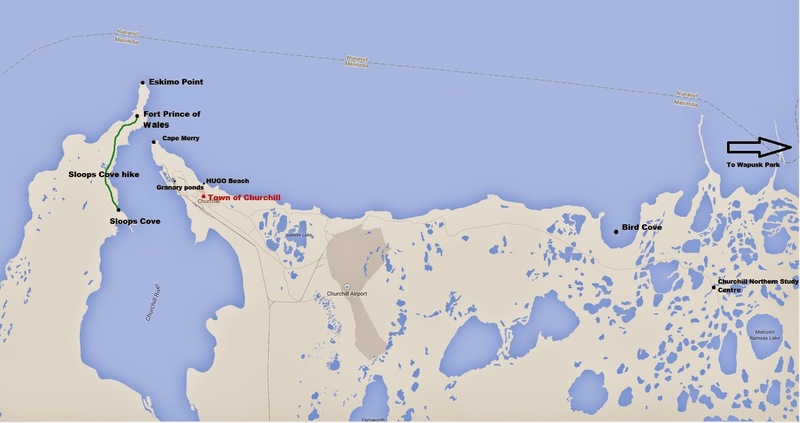 The red dot is the town of Churchill and the rest are different notable places. Starting from the top right, is Eskimo Point, which used to be an island, but due to the land rising, has become a point. Fort Prince of Wales is a Fort that was built in 1731, as a defence for the Hudson Bay Company against the French. It is kind of ironic how later it was later surrendered to a French crew dying of scurvy, because the people inside the fort were not equipped to defend (they didn't know the French were dying of scurvy, and in no way ready to make an assault). We did the Sloops Cove Hike tour, from Sloops Cove to the fort too, which was really fun. We boated across the river, then from sloops cove, hiked to Fort Prince of Wales, but you'll have to wait until the next post for the birds we saw on it. Then to Cape Merry, a National Historic Site, there is the Cape Merry Battery there, so if the French attacked they could bombard them from both sides. The down to the granary ponds, a few ponds in the town of Churchill that was full of shorebirds and waterfowl. Then across to the beach where we saw the Hudsonian Gotwit as you will read below. Then we go east to Bird Cove, where the wreckage of the Ithica is beached. Then a bit South-East to the Churchill Northern Study Centre! Click on the map for full size. Sunday we woke up at 7:00 and went out to a beach to see what we could see, which was a good idea, because we saw a lifer, Hudsonian Godwit! It was feeding along the shore, with the white waves behind it. When we were watching the Godwit, a small flock of Long-tailed Ducks (also called Old Squaw) flew by, a lifer! We drove to Cape Merry, on the way we saw a Polar Bear, sulking along the rocks near the shore, we were really excited and drove back to the hotel and woke up the rest. We drove back to the spot to see it we could find it, but unfortunately not. We stopped at the Granary Ponds for a few minutes, nothing new. Here is a White-crowned Sparrow on the massive wheel of a Tundra Buggy. 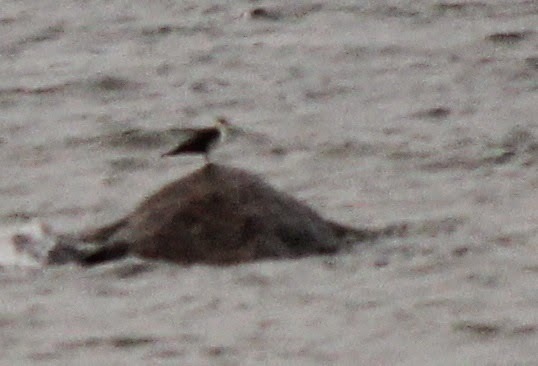 We saw a Tern pass a fish to another Tern, which flew away with it. We also stopped at the "Five star hotel", that someone started but never finished, like everything in Churchill. Everything is abandoned and just left there. We drove around a bit more, and ran into a mother polar bear and a cub. We also went and saw miss piggy, a airplane that crashed, and was left there. We saw quite a few Sandhill Cranes, walking about. We had to get back to the town, because we were going to eat supper at another on of our mom and dads friends house. On the way back we saw some Arctic Tern chicks, and a Bald Eagle. We were eating supper and we heard some bangers go off. That means they were scaring bears away from town. We hopped in the car and drove to Cape Merry, there was a mother and a cub that had wandered to close to town and they were scaring them away. Stay tuned for the next post!! !